Every spring, the intrepid gardener makes his choice of plants and produce. Invariably, a few courgettes will be among things chosen for his patch and, if the weather is fine, they will yield more vegetables than the keenest cook can know how to deal with. This is the famous glut: runner beans and Jerusalem artichokes are two other types that threaten kitchen sanity, but courgettes are perhaps the most insistent. Their particular problem is that if you leave them for a few days they don’t remain courgettes but develop into giant, and dreadful, marrows: watery, horrid and inedible. 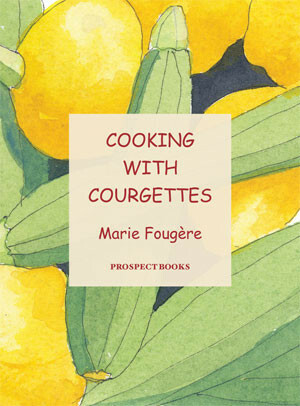 Marie Fougère was first published in France but her recipes were so creative and inventive that we thought it a fine candidate for translation. English readers can now rustle up courgette and apple soup, baked courgette omelette, courgette tarts, a tartare of courgettes, fish with courgettes, stuffed courgettes, courgette fritters and tempura, courgette flower fritters, and even courgettes for dessert. This is the ideal present for gardener or cook. The level of skill demanded by the recipes is not so high as to pose problems for any household provider. Marie Fougère is an artist, a teacher and a writer. She has published works of literature and fiction, and she writes cookery books (with the emphasis on organic produce) mainly for Utovie, a small publishing house in the Pyrenees. A PDF of the preliminaries, some sample recipes and a list of recipes.